Former ICTU Chief Peter Cassells has been appointed as mediator in the dispute over the controversial Corrib gas pipeline. The announcement was made today by the Minister for Natural Resources Noel Dempsey. Mr Cassells takes up the position today. Minister Dempsey said Mr Cassell's previous experience meant he was ideal for the position. “Peter is very well known, and he has a lot of experience in industrial relations and in mediation generally”, Minister Dempsey said. “I felt as former leader of ICTU and current Chairperson of the National Centre for Partnership that he was ideally placed”, he added. 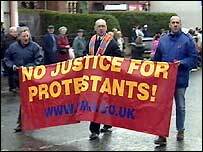 There has been a poor turnout at today's 'Love Ulster' parade in Belfast. Loyalists were hoping up to 30,000 people would take to the streets to protest against what they say are repeated concessions to Republicans. The PSNI say only about 2,000 have braved the weather. The rally's organisers say the peace process discriminates against Protestant culture. A car belonging to an independent member of the district policing partnership in Larne, County Antrim, has been vandalised. Corrosive liquid was poured on to the vehicle parked outside Terry McCaughan's home on Victoria Road. The attack took place between 2020 BST on Friday and 0900 BST on Saturday. A motive for the attack has not been established. Mr McCaughan said he may have been targeted for his outspoken comments on drug abuse in the area. "We feel that cocaine use is on the up and we feel that perhaps people in Larne don't want this highlighted," he said. "I'm not the first independent DPP member to be targeted. "These people seem to think that if they target you, then you will stop saying things that need to be said. "I was elected to Larne DPP to monitor things that are going on in the town and I will say things I feel need to be said." Chief Constable Hugh Orde and Security Minister Shaun Woodward are backing calls for a forensic expert being brought in to investigate the cases of the "Disappeared" to look into the murder of Lisa Dorrian. Responding to a request in Parliament from North Down MP Lady Hermon to encourage the Dorrian family to maintain confidence in the police investigation, Mr Woodward said Sir Hugh continued to take an interest in the case. He said: "He is ensuring that maximum resources are used and agrees with me and my honourable friends that we should use forensic experts to help to find Lisa's remains. "The investigation is ongoing and we can only hope that we find Lisa's remains before long and bring the perpetrators of her death to justice." In July, the Dorrian family, backed by Lady Hermon, requested that the remit of the forensic expert was extended to include Lisa's murder. Both the British and Irish governments agreed to look into the possibility of doing so but, at present, the legislation only covers murders that were committed before the signing of the Good Friday Agreement. But the family are hopeful steps will be taken to adapt the legislation to include Lisa's case. It is eight months since the 25-year-old shop assistant went missing after a party at a Ballyhalbert caravan park. Despite sea, air and land searches and the subsequent murder inquiry, her remains have never been found. It is widely believed individuals linked to the LVF were behind the killing but detectives have been met with a wall of silence. A number of people were arrested in connection with her murder but all were released without charge. A police spokeswoman said: "Police remain committed to the recovery of Lisa's body to help bring closure to her family and subsequently to bring those responsible for Lisa's murder before the courts. "Detectives are in regular contact with the family through this difficult time and continue to urge anyone with information to come forward." The father of a loyalist terrorist murder victim last night offered to meet police Special Branch officers accused of protecting the killers. Raymond McCord said the ex-RUC men who allegedly shielded paramilitary informers that were involved in beating his son to death were running scared. With Police Ombudsman Nuala O'Loan examining the murder as part of a widening probe into claims of a massive collusion plot, it has been reported that officers have refused to be interviewed. But Mr McCord challenged them: "What are you frightened of? "If you don't want to Mrs O'Loan come and talk to me. Give me the information you have on my son's murder." His son, ex-RAF operator Raymond McCord Jr (22), was killed by Ulster Volunteer Force men and dumped in a north Belfast quarry in November 1997. Ever since, Mr McCord has claimed Special Branch officers thwarted the murder inquiry because it implicated two UVF agents. 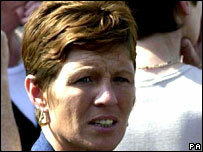 Mrs O'Loan's two-year investigation into the case has been stretched to examine up to a dozen other killings. In the Republic on Thursday a senior politician used parliamentary privilege to name two Belfast loyalists allegedly linked to the McCord murder. Pat Rabbitte, leader of the Irish Labour Party, claimed in the Dail parliament that Special Branch informer Mark Haddock and another man were present when Mr McCord was murdered. Haddock (39), from Belfast's Mount Vernon district, is awaiting trial accused of attempting to murder a doorman in Co Antrim nearly three years ago. Mr Rabbitte claimed under privilege: "The central allegation is that Haddock was not charged with any crime because he was an informer who had to be protected. He was able to act with impunity, while the police effectively colluded in his crimes." The Dublin TD also alleged Haddock was linked to seven other murders while working as an RUC police informer. These were: Catholic builders Gary Convie and Eamon Fox in 1994; alleged informer Thomas Sheppard in 1996; Protestant clergyman the Rev David Templeton in 1997; Billy Harbison in 1997; former unionist politician Tommy English in 2000; and David Greer in 2000. An interim report by Mrs O'Loan's investigation team has been sent to the Public Prosecution Service. But an exhaustive dossier has still to be completed, and a decision has yet to be taken on whether to recommend prosecutions against any Special Branch officers. With some of those under investigation vowing not to talk to the Ombudsman's staff because they believe the probe is an attempt to demonise them, Mr McCord insisted they had no right to silence. "Serving and past police officers have given me information because they are disgusted with the antics of Special Branch," he said. "Murders could have been prevented and they weren't allowed to be because it would jeopardise informers." Hopes were high last night that today's Love Ulster mass rally will pass off peacefully, despite the expected presence of loyalist paramilitaries. The terrorists will not be "uniformed" and there will be no show of strength, organisers said. Those behind the event also said they were not expecting any trouble, but they accused republicans of attempting to fuel tensions by torching Whiterock Orange Hall on Thursday evening. There had been speculation that up to 40,000 people would attend the Protestant rally which was organised to voice unionist frustration at political developments, but it is now believed the number could be significantly smaller. The event was organised in the wake of civil disruption which followed the re-routed Orange Order parade at Whiterock. 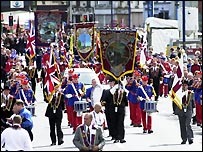 The parade, which will include up to 70 bands, is due to start at 11.30am and travel along Northumberland Street, Shankill Road, Woodvale Road and finally gather at Woodvale Park at around 1.30pm. A wreath is to be laid at the scene of the Shankill bombing. The Rev Mervyn Gibson of the Loyalist Commission, who is due to speak at the event, said there was definitely going to be no paramilitary show of strength but said everyone is invited and "whoever's there is there". Event organiser Willie Frazer of the victims' group Families Acting for Innocent Relatives (FAIR), said he was not expecting any trouble. He said if any loyalist paramilitaries attended they would be able to hear that the people on the streets wanted an end to violence. "If they do come it is better they hear from the communities that they want an end to violence," he said. "I will be calling for peace and unity, for an end to drug dealing and for all the organisations attacking each other to stop. I will also be calling for the Government to recognise the problems in our communities. "There's a situation out there within the republican movement trying to heighten tensions. Whiterock Orange hall has not been touched in years and yet just days before this rally it was torched. This was not a coincidence. This was done to raise tensions." Chief Superintendent Mike Little said: "I would also ask all those attending from outside the district to travel safely while making their way to and from north Belfast. Local police traffic and information patrols will be on hand to assist motorists on the day. Parking arrangements have also been made by the organisers for those planning to travel by bus." Although it is believed the event will pass off peacefully there are fears that trouble may kick off as people make their way home past flashpoint areas. Progressive Unionist leader David Ervine has suggested there is reason to hope the UVF's feud with the LVF is drawing to an end. Speaking on BBC NI's Inside Politics, Mr Ervine said the UVF was no threat to the peace process. He called for time for the organisation to follow the IRA's decision to end its campaign and decommission. Mr Ervine also attacked calls for unionist unity and insisted it was time for diversity in unionism. "I detest the concept of unionist unity," Mr Ervine said. Too often it resulted in unionists "huddling around" the lowest common denominator, he added. Loyalists have gathered in west Belfast to take part in the "Love Ulster" parade. The event, which organisers say is being held to "promote unionist unity", began on the Shankill Road at 1200 BST. A rally is be held in Woodvale Park following the march. Earlier this week, NI Secretary Peter Hain met with the demonstration's organising committee. Afterwards, Mr Hain said he had been assured the event would be "peaceful and dignified". Former republican prisoners have reacted with anger after the offices of a support group was raided by the PSNI yesterday. The offices of Teach na Fáilte in Strabane, Co Tyrone, and on the Falls Road in Belfast were searched and documents were removed during a series of raids carried out across the North yesterday morning which saw 20 homes and businesses targeted. Set up almost ten years ago, Teach na Fáilte works with former Irish National Liberation Army prisoners. A Teach na Fáilte spokesperson said a number of homes belonging to Teach na Fáilte employees were also raided by several heavily armed PSNI units. A leading figure in the ex-prisoner’s group Eddie McGarrigle hit out at the PSNI after he was tossed from his wheelchair by a PSNI man attempting to pull the shutters down outside the group’s Strabane office. “At a time when Teach na Fáilte is getting its doors sledgehammered open Bertie Ahern met with political representatives of a group that has killed 28 people since its ceasefire,” said Mr McGarrigle. “What is Bertie Ahern going to say about these raids? “Two years ago he spoke about his support of Teach na Fáilte and the republican socialist movement and the direction they are taking. “The mood of the republican socialist movement and former INLA prisoners is one of absolute anger. “They have taken away all our funding documents and put a lot of people out of employment. “For over ten years we have been peace building and working towards conflict resolution and this work can all be verified. “People should be aware that the offices of the IRSP were not raided and with the exception of two people who are members of the IRSP the majority of raids were carried out at the homes non-political people. They are simply employees at Teach na Fáilte. “Many of these people work with us on the New Deal programme. Earlier this month Mr McGarrigle called on anti agreement republicans not on ceasefire to bring their campaigns to an end. Belfast-based IRSP man Paul Little said the raids were politically motivated. A spokesperson for the PSNI said the 20 raids were carried out by their Organised Crime Squad. The PSNI claimed the raids formed part of an ongoing criminal investigation. Despite the various badges, buttons, and pins having been sold on eBay for a number of years, six different listing of items related to the Irish National Liberation Army on eBay were recently removed, with the explanation that eBay did not permit the posting of items that promoted hatred or violence. In response to this action, Peter Urban of the International Republican Socialist Committees wrote to eBay protesting the suspensions and arguing tha, after seven years on ceasefire, it was absurd to claim that the INLA were advocates of violence. Thanks for writing to us. I appreciate the chance to help you with your questions. I have reviewed your listings and found that they were removed correctly. eBay does not allow the sale of items related to groups who promote violence, racial or religious intolerance, or glorify hatred. The INLA has been identified to us by a government agency as a group that fits into this category, and therefore will not be allowed on eBay. This intervention of governmental agencies into the affairs of eBay, especially when the information they are providing appears to be inaccurate, arbitrary, and intended to censor shades of political perspective, must be condemned. today, in Iraq and Afghanistan as well as elsewhere, wreaking death and destruction on innocent civilians; but the INLA, which has been on a cease-fire since August of 1998 is labled as advocates of hatred and violence." "This ban of items bearing the emblem of the INLA," he concluded, "cannot be justified under the quidelines eBay quoted. Clearly, this is nothing less than an act of political censorship and part of an effort to demonise any organisation prepared to defend the interests of working class people against the armed might of the imperialist powers of the world. Claiming that the Irish National Liberation Army was identified to them by an 'agency of the government' as a group "who promote violence, racial or religious intolerance, or glorify hatred", eBay suspended the listing of all items related to the Irish republican socialist organization. One of the listings that was suspended did not even include the name of the INLA or any depiction of weapons, but was instead a badge in support of the Republican Socialist Prisoners of War fund, which included the group's traditional image of a prisoner clasping the bars of a cell. The Irish Republican Socialist Committees, and independent republican socialist organization, is asking all those who share their concerns over this act of political censorship by the on-line auction giant and the troubling intervention of government agencies in determining the content of eBay's listings to send messages of protest to eBay's community feedback form, which can be accessed >>HERE. There are fears that the loyalist feud could affect the education of children in east Belfast estates. One school said pupils were also being injured as they replayed paramilitary violence. One child has been seriously injured and others frightened and traumatised following the loyalist feud in the Knocknagoney and Garnerville estates. 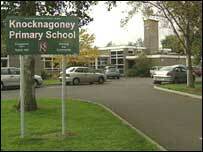 So many pupils have left Knocknagoney primary school, it says it is in danger of losing a teacher. Principal Mandy White said: "I would like people to recognise what has happened. "The effect that it has had on the school, the effect that it has had on the children and the staff. "We need support - for people to come to us and offer support in whatever way they can. "Not just financial support - but people coming up to inquire of the staff if they are okay and can we help." Children in the area had gone through a traumatic experience and the school needed extra resources, she said. The loss of pupils had meant a loss of revenue for the school, said the principal. The school said it had not even had a phone call from the Belfast Education Board to ask how it was coping. The board said it was in discussion with Knocknagoney but admitted a letter has only just been sent out and should arrive next week. 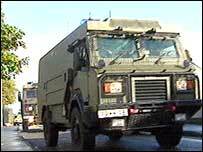 A bomb has been made safe by Army experts near Armagh city. The "small viable device" was found near the Baltarran Road on Friday afternoon. The police carried out searches on Thursday and Friday following two telephone bomb warnings received on Thursday. The device was in a metal box placed on the ground and police said it was capable of causing injury if it had been handled. Police want to hear from anyone who saw anything suspicious in the Baltarran Road area - a minor road off the main Killylea Road - in recent days. They can be contacted on 028 37 523311. "THE Greysteel massacre stands out as a horror of horrors in 30 years of bloody conflict in Northern Ireland. On Hallowe’en night, 31 October 1993, masked gunmen of the outlawed Ulster Freedom Fighters (UFF), the killer wing of the loyalist Ulster Defence Association (UDA), walked into the Rising Sun bar in the tiny village of Greysteel just outside Derry, shouted "Trick or treat" and mowed down six Catholics and one Protestant with an AK47 assault rifle and a Browning automatic pistol. One of their victims was 81 years old. None had any involvement in the conflict". Greysteel murderer Stephen Irwin has been jailed for four years for slashing a football supporter with a knife. Belfast Crown Court heard Irwin's victim needed almost 200 stitches. The attack happened during last year's Irish Cup Final in Windsor Park. Irwin was sentenced to eight life sentences but was released under the terms of the Good Friday Agreement. Crown Court Judge Kevin Finnegan said the court could well have been dealing with another murder charge. The Police Ombudsman’s report into allegations of collusion surrounding the loyalist murder of two young Co Armagh brothers is to be published in the New Year, Daily Ireland has learned. Gerard and Rory Cairns were shot dead by the Ulster Volunteer Force (UVF) at their home in the village of Bleary on October 28, 1993. Today marks the 12th anniversary of their deaths. The UVF gang involved in the Cairns’ killings included two high-level informers – Robin ‘The Jackal’ Jackson and Billy ‘King Rat’ Wright. The guns used in the attack were brought into the North in 1988 from South Africa by Ulster Defence Association (UDA) and British army agent Brian Nelson. Nelson’s handlers had full knowledge of the weapons importation, but did nothing to prevent it reaching these shores. In the moments before the Cairns’ killing, the police set up a series of roadblocks near their isolated home. Gerard and Rory’s killers were able to pass through these roadblocks unchecked. It is these major breaches of policing duty which the ombudsman is probing. Investigators have been looking at the Cairns’ case for almost a year. It was previously raised by human rights organisations Relatives for Justice and An Fhírinne. The dead men’s father, Eamonn Cairns, said meetings with the Ombudsman have been productive. “The full report on the collusion aspect of my sons’ murders will be completed next year,” he said. “The Ombudsman is about three-quarters of the way through the case. The pain of Rory and Gerard’s murders has never left the Cairns family. Their younger brother Liam Cairns, says that in the 12 years since, the family still do not know the true circumstances surrounding the killings. THE Progressive Democrats were yesterday accused of backing down from their proposal that the so-called Colombia Three be made serve their prison sentences in Ireland. Fine Gael justice spokesman Jim O’Keeffe yesterday claimed Tánaiste Mary Harney suggested last August that the Transfer of Sentences Bill might provide a solution to allow the three republicans serve sentences in Ireland for convictions handed down in Colombia. The claim of a PD U-turn emerged during an exchange between Mr O’Keeffe and Justice Minister Michael McDowell as the Report Stage of the Transfer of Sentence Bill was being debated in the Dáil. Mr McDowell said the Bill was prepared long before the Colombia Three controversy arose. He said it was never the case that the Bill was “tailor made” to deal with that situation. The Justice Minister said the State which imposed the sentence needs to sign up to the Convention and Protocol that allows sentences to be transferred from one jurisdiction to another. Colombia has not done that to date, he said. He also pointed out that Colombia has also applied for extradition of the three men, James Monaghan, Niall Connolly and Martin McCauley. He went on to say that if extradition was not possible, then it was unlikely that sentences could be transferred if there was no equivalence between the offences in Ireland and Colombia. However, the minister’s spokesperson later said that it would remain an option if extradition was not possible because of other reasons other that the need for equivalent offences. However, Mr O’Keeffe contended the minister’s identification of obstacles to this solution flew in the face of a press release issued by the Tánaiste in August when she specifically identified this legislation as a means of making the men serving their 17-year sentences. Meanwhile, Mr McDowell also formally withdrew his threat yesterday to outsource prison escorts and other services to private contractors. In a Senate debate on the Prisons Bill, he said the acceptance by prison officers of new work practices and pay arrangements no longer made those contingency plans necessary. The DUP must also deal with the issue of decommissioning - over the issue of Ulster Resistance weapons, Sinn Fein has inisted. Ian Paisley's party came under fire from republicans as the prospects for early devolution talks faded further over the Governments' plans for on-the-runs. As it emerged meaningful talks could be postponed until after legislation on fugitives has passed through Parliament, Sinn Fein attempted to apply pressure on the DUP which has vowed to oppose the plan - including possible human rights-based legal action. Sinn Fein President Gerry Adams said the DUP would have to take full responsibility for the continuation of direct rule and unaccountable government if it failed to grab the current opportunity. "There will be difficult decisions for the incoming Executive and Assembly. But perhaps the biggest decisions at this time is for the DUP," the West Belfast MP said. "Do they have the confidence to govern this place with the rest of us or will they allow British Ministers to continue to do so in the interests of the British government instead of the people here?" He said continuing Direct Rule would mean more cuts to public services, including education and health as well as increased rates and water charges. The attack came as DUP deputy leader Peter Robinson said there was no future for either loyalist or republican paramiltaries in Northern Ireland. Jailed "Real IRA" leader Michael McKevitt is to launch an appeal against his conviction for directing the activities of a terrorist organisation. The Court of Criminal Appeal was yesterday told the case, which will run for four days, will go ahead in two weeks time. The three-judge court will first have to read the transcripts of the 27-day trial before the Special Criminal Court two years ago. Michael McKevitt (aged 52) Beech Park, Blackrock, Dundalk, Co Louth was jailed for 20 years by the Special Criminal Court for directing the activities of a terrorist organisation between August 29, 1999 and October 23rd, 2000. The court also imposed a concurrent six-year sentence for membership of an unlawful organisation, styling itself Oglaigh na hEireann, commonly referred to as the "Real IRA". Passing sentence in the Special Criminal Court Mr Justice Richard Johnson presiding said McKevitt played a leading role in the organisation referred to as the Real IRA. The court was satisfied that the offences for which McKevitt was convicted were "planned and pre-meditated "and caused serious harm to people and property. The court said the offences for which McKevitt were convicted were outside the date of the Omagh bombing. "The court must not be seen to seek revenge for that atrocity and would not seek to do so," Mr Justice Johnson said. The appeal will go ahead on November 8 next. 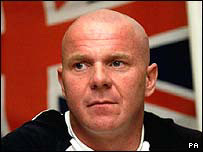 Former loyalist paramilitary leader Johnny Adair has been sentenced to a 12-month supervision order after admitting assaulting his wife. The 42-year-old, formerly of Chorley New Road, Horwich, attacked his wife in a park in the town on 26 September, hours after being released from jail. Adair was seen kneeling on his wife and "punching her repeatedly with both arms," Bolton magistrates court heard. He walked free from jail but was ordered to pay her £250 compensation. Gina Adair suffered bruising to her face and cuts but did not require hospital treatment. The couple have been married for 23 years and have four children. Adair, a former senior member of the Ulster Defence Association (UDA), moved to Bolton, Greater Manchester, after an internal feud in the organisation. He had been released from jail on the day of the attack after serving 39 days for harassment. A group of children and their parents reported the attack to police after they saw him drag his wife by the hair as she tried to run away. The couple had been walking home from a nearby pub after celebrating his release from prison. The court was told the harassment charge did not relate to Mrs Adair but that he did have some history of domestic violence. The Probation Service will supervise him one-on-one as he is not deemed suitable for group work. Ch Supt Dave Lea said the attack was "totally unacceptable." "This attack took place, somewhat shamelessly, in the middle of a park in broad daylight in front of schoolchildren playing football close by. "We are committed to reducing violent crime across Bolton and, as a result, we pursued a prosecution in this case despite the fact that the victim did not want to give evidence." A man accused under parliamentary privilege of being a UVF killer and police informer has been denied bail. Mark Haddock, 36, of Mount Vernon in Belfast has been in custody since August 2003 charged with the attempted murder of a nightclub doorman. A police inspector told the court his release would put lives in danger. The defence argued that his length of detention prior to the start of a trial was unreasonable, but a judge said his release could lead to public disorder. The bail application was heard at Belfast Crown Court on Friday. A police inspector said the accused had been a "leading member of the UVF and drug dealer" for some time. Defence pointed out that his co-accused in the case - who had been in custody for the same period of time - was released on bail last week. However, the judge denied bail, accepting that Mr Haddock's release could lead to public disorder, and because the trial is due to start next week. On Thursday in the Irish Parliament, the Dail, Labour leader Pat Rabbitte claimed Mr Haddock was a "UVF leader". He alleged the accused had been implicated in a number of murders, but had escaped punishment as he was a "police informer who enjoyed protection". Mr Haddock is accused of trying to murder nightclub doorman Trevor Gowdy who was found unconscious on the Monkstown estate in Newtownabbey in December, 2002. Mr Gowdy, from Ballyclare, had been repeatedly stabbed and struck with a hatchet and baton. A long-term resolution to parade disputes in Derry between the Apprentice Boys and the Bogside Residents' Group may be imminent. Derry businessman Garbhan O'Doherty said he is hopeful the two sides are nearing an understanding. Mr O'Doherty has been mediating between the groups. The agreement would ensure talks over feeder parades for the annual August march would involve "housekeeping" issues rather than fundamental ones. Mr O'Doherty did not want to be drawn on the detail of the talks, but he did confirm they had intensified and there was reason to hope the decade-long dispute was reaching a long-term solution. "All of the interested parties are working on the long-term resolution to the Apprentice Boys marching issue in the city," Mr O'Doherty said. "Papers have been filed by the various parties including the chamber of commerce and work is ongoing and it is hoped a resolution will follow shortly." A meeting involving the interested parties is scheduled for next Monday. Mr O'Doherty, a member of Derry's chamber of commerce, has been involved in mediation between the loyal orders and residents' groups in the city for several years. The Apprentice Boys demonstration every August commemorates the Relief of Derry from the forces of the Catholic King James II in 1689. It has proved contentious when marchers enter the mainly nationalist west bank of the city, and the issue of "feeder" parades to the main march has also caused controversy. Sinn Féin spokesperson on Collusion, West Tyrone MP Pat Doherty has said that the decision of senior Special Branch officers to refuse to participate in to a Police Ombudsman investigation into a string of UVF murders involving a Special Branch agent will only make nationalist more determined to expose the true nature and extent of collusion between the RUC and British Army and Loyalists. "The reality is that Ronnie Flanagan transferred much of the RUC Special Branch structures responsible for directing the policy of collusion into the PSNI. These people need to be weeded out of the PSNI if we are to have any chance to realising a new beginning to policing that is free from partisan political control. "However, the evidence to date is that political policing is alive and well within the PSNI and other agencies that are contaminated by former RUC Special Branch officers. An Orange hall in west Belfast has been damaged in an arson attack, according to police. A window of the property was broken and flammable liquid was poured in and set alight sometime between 1900 BST on Thursday and 0730 BST on Friday. The fire caused scorch damage to the hall and kitchen of the building. A spokesman for the Order said the attack was a "deliberate attempt to stir up inter-community tensions in north and west Belfast". DUP assembly member for west Belfast Dianne Dodd's said the attack was "clearly aimed at intimidating the local Orange brethren". "I would urge community and political leaders in the nationalist community to come out publicly and condemn this wanton act of destruction," she said. Sinn Fein and the SDLP condemned the attack on the hall. West Belfast Sinn Fein Councillor Tom Hartley said: "Sectarian attacks on churches, schools, businesses and homes from whatever quarter are wrong and should be condemned." SDLP Upper Falls Councillor Tim Attwood said: "There can be no excuse or justification for attacks of this nature." Fraud Squad detectives have stepped up their probe into alleged police service corruption by launching searches of houses and PSNI offices, it can be revealed today. The internal investigation is examining the cancellation of a contract to supply the force's transport services wing with armour plating for police vehicles. Police have given little away about the search operation, which was launched yesterday. But it is understood that PSNI premises in south Belfast and Seapark, Carrickfergus were among those targeted. A police service spokesman said: "I can confirm that searches were carried out at PSNI buildings and some houses yesterday." The PSNI has rejected calls to bring in police fraud investigators from across the water to conduct the investigation. It has also faced criticism for not suspending any staff members. The probe was ordered after a High Court judge, Sir Liam McCollum, called for a criminal investigation. He spoke out after the PSNI paid a £400,000 settlement to Northern Ireland Sheet Metal Works, the Belfast firm that was stripped of a 2001 contract to supply vehicle armour plating. The judge said there was a "prima facie" case that "some person or persons" within the police service had "deliberately undermined" the company and "wrongfully discredited" its delivery of the contract. He also stated that it was "difficult to attribute an innocent motive" to anyone involved in the police service's decision making process. Two years after they were elected, all 108 members of the Northern Ireland Assembly are scheduled to meet for the first time at Stormont. However, the gathering won't be the long-delayed official opening of the Assembly. Instead, MLAs have been invited to the Long Gallery in Parliament Buildings on Monday for a budget briefing from direct rule Finance Minister Lord Rooker. The meeting is expected to be the first in a series of direct discussions between the direct rule team and the Assembly as a whole. More briefings are expected to take place before Christmas. Those talks are likely to include the upcoming shakeup of public services under the Review of Public Administration, which is due to be released next month. MLAs may also be consulted about water charges and other measures. In a speech last month, Secretary of State Peter Hain set out his intention to make a series of "tough decisions" that could no longer wait for the return of power-sharing. As part of that drive, he took the unusual step on Tuesday of announcing budget details himself, including the 19% rise in the regional rate. The Review of Public Administration is due to be unveiled next month. Monday's meeting is not being held in the main Stormont chamber because the Assembly remains a long way from being formally constituted. The first official sitting of the Assembly would trigger a six-week timetable for selecting an Executive or holding a new election. And with the DUP and Sinn Fein still a long way from reaching an agreement over power-sharing, Ministers won't be rushing into that scenario. A leading Ulster loyalist was linked to a string of murders while working as a police Special Branch informer, a leading Dublin politician has claimed under parliamentary privilege. Mark Haddock from north Belfast was accused in the Dail of being the UVF terrorist at the centre of a major investigation by Police Ombudsman Nuala O'Loan. A Shankill-based loyalist, John 'Bunter' Graham, was also named during the debate as a UVF chief. The allegations were made by Pat Rabbitte, leader of the Irish Labour Party. Thirty-nine-year-old Haddock is currently awaiting trial on a charge of attempting to murder a Co Antrim pub doorman in December 2002. During yesterday's Dail debate, Mr Rabbitte alleged that the UVF murder of ex-RAF airman Raymond McCord (22), in Newtownabbey in November 1997 was carried out on Haddock's orders. Mr McCord's father Raymond Snr has alleged for years that a Special Branch agent was responsible for his son's murder. His claims have been the subject of a long-running probe by the Police Ombudsman. A report on the findings of this investigation is believed to be near to completion. Mr Rabbitte said it was alleged by Mr McCord Snr that his son was killed to prevent Shankill UVF chief John "Bunter" Graham finding out about Haddock's drug operations. The TD also claimed that another Special Branch informer, whom he named as John Bond, was present at the murder. Calling for an international public inquiry to be established once the Ombudsman's report is published, Mr Rabbitte said: "The central allegation is that Haddock was not charged with any crime because he was an informer who had to be protected. "He was able to act with impunity, while the police effectively colluded in his crimes." Mr Rabbitte also claimed that Haddock was associated to the murders of seven others while serving as a RUC police informer. According to Mr Rabbitte, these murders were: Catholic builders Gary Convie and Eamon Fox in 1994; alleged informer Thomas Sheppard in 1996; Protestant clergyman, Rev David Templeton in 1997; Billy Harbison in 1997; former loyalist politician Tommy English in 2000 and David Greer in 2000. Mr McCord Snr travelled down to Dublin for the Dail session. He held talks with Mr Rabbitte last week in a meeting arranged by former Newtownabbey Labour councillor Mark Langhammer, who is now a member of the Irish Labour Party's national executive. Mr Langhammer today said the McCord case will be the "ultimate litmus test" for establishing accountable policing here. The alleged Ulster Volunteer Force (UVF) killers of a 22-year-old Protestant have been named as Special Branch informers by the leader of the Irish Labour party. Using parliamentary privilege, Pat Rabbitte yesterday named Mark Haddock and John Bond as the men responsible for the brutal 1997 murder of Raymond McCord Junior. He also claimed the pair were responsible for trying to bomb a Sinn Féin office in Monaghan town in 1997. In an astonishing attack on the UVF and its links to Special Branch, Mr Rabbitte said leading Belfast loyalist John ‘Bunter’ Graham was the organisation’s leader. And he called for an international independent inquiry into collusion between the UVF and security services. Mr Rabbitte said: “The UVF murdered Raymond McCord because he had been summoned by John ‘Bunter’ Graham, the officer commanding the UVF on the Shankill Road, to account for his role in ferrying drugs for Mark Haddock. “He was murdered to prevent Graham finding out about Haddock’s unsanctioned drugs operations. “At least two members of the gang who carried out the murder were Special Branch informers. They were Mark Haddock, who ordered the murder, and John Bond, who was present when Raymond McCord was murdered. Mr Rabbitte said he had information Haddock, who is currently facing charges of attempted murder, has been involved in eight murders since his recruitment as a Special Branch informer in 1993. The murders are that of Sharon McKenna, Gary Convie, Eamon Fox, Rev David Templeton, Billy Harbinson, Tommy English, David Greer and Raymond McCord Junior. He added: “The central allegation is that Haddock was not charged with any crime because he was an informer who had to be protected. Replying to Mr Rabbitte, minister of state at the Department of Foreign Affairs, Noel Treacy, said government had complete confidence in the independence and competence of the Ombudsman’s office in carrying out a rigorous investigation. Mr Rabbitte’s Dáil address has been welcomed by Raymond McCord Senior, whose son Haddock and Bond are accused of murdering. He said: “This is only the beginning. The UVF has been controlled by the Special Branch since the 1970s. A Police Ombudsman report on the murder of Raymond McCord Junior is to be published next month. It is expected to recommend prosecutions against six Special Branch officers who ran UVF members in north and west Belfast. In a report on the McCord murder compiled by human rights group British Irish Rights Watch (BIRW), the man who Pat Rabbitte believes is the leader of the UVF, John Graham, is named as a Special Branch informer. BIRW director Jane Winter, who has investigated dozens of paramilitary killings, is in no doubt the UVF was “deeply infiltrated” by Special Branch for a “very long time”. “There has been a high-level of collusion for some time,” said Ms Winter. A leading Ulster loyalist was involved in a string of murders while working as a police Special Branch informer, it was alleged last night. Mark Haddock from north Belfast was accused under parliamentary privilege in the Dail of being the UVF terrorist at the centre of a massive investigation by Police Ombudsman Nuala O'Loan. Thirty-nine-year-old Haddock is currently awaiting trial on a charge of attempting to murder a Co Antrim pub doorman in December, 2002. During yesterday's Dail debate, Mr Rabbitte alleged that Haddock had been a long-standing Special Branch informer while involved in a number of murders with the Mount Vernon UVF in north Belfast. He also stated that the UVF murder of ex-RAF airman Raymond McCord (22), in Newtownabbey in November 1997 was carried out on Haddock's orders. His claims have been the subject of a major probe by the Police Ombudsman. A report on the findings is believed to be near to completion. Mr Rabbitte further alleged that Mr McCord Jnr was killed to prevent Shankill UVF chief John "Bunter" Graham finding out about Haddock's drug operations. Mr Rabbitte also claimed that Haddock was linked to the murders of seven others while serving as a RUC police informer. According to Mr Rabbitte, these murders were: Catholic builders Gary Convie and Eamon Fox in 1994; alleged informer Thomas Sheppard in 1996; Protestant clergyman, Rev David Templeton in 1997; Billy Harbison in 1997; former loyalist politician Tommy English in 2000 and David Greer in 2000. Mr McCord Snr travelled down to Dublin for the Dail session. The biggest shake-up of public services in Northern Ireland is due to be unveiled next month. As part of Secretary of State Peter Hain's drive to push through "tough decisions" about Northern Ireland's future, the Government is preparing to publish proposals from the Review of Public Administration (RPA). In mid-November the review is expected to recommend a dramatic cut in the number of councils in Northern Ireland, reducing the current 26 down to six or seven. Scores of local councillors will find their seats have been swallowed up by the changes. The regional boards that look after health and education are expected to be centralised, and other quangos also face the axe. The reforms will be revealed more than three years after the review was set up to peel off Northern Ireland's layers of government. The Assembly at Stormont was suspended soon after it was established and since then Direct Rule Ministers to finish the review - saying they wanted a local administration to have an input in the final say. But Mr Hain indicated last month that he is no longer willing to leave big decisions stuck on hold. So after announcing what is thought to be Northern Ireland's biggest ever rise in the regional rate - 19% - Mr Hain is ready to introduce controversial cuts to local government. Ministers and officials acknowledge that they are happy for the moves to be seen as a direct challenge to the parties to get back into a power-sharing Executive. Last month Mr Hain described the review's proposals as "the most radical, cost saving changes in structures for local authorities, health and education and other areas of government". He added: "These reforms will be ambitious. They will challenge the status quo. They will disrupt power bases and vested interests. They will lead to a radical shift of resources from the back room to the frontline." The impact of the RPA's changes are due to be discussed at a conference for town managers and council chief executives next week. Stephen Kingon, managing partner of conference sponsors PricewaterhouseCoopers, said local government executives and ratepayers should not underestimate the magnitude of change the RPA will require. "This reform agenda has already been described as one of the biggest change management programmes in Europe," he said. "Everyone, from political parties and elected representatives to council staff and ratepayers will be affected by these changes." **"Dirty war: an offensive conducted by secret police or the military of a regime against revolutionary and terrorist insurgents and marked by the use of kidnapping and torture and murder, with civilians often being the victims". (wordnet) This is one chapter from a work at Irish Northern Aid. By clicking on these links, you can read the rest directly on site. "Shoot-To-Kill" is a covert strategy of assassination of targeted unarmed Republican supporters, of active or inactive IRA personnel, or the killing of combatants without the chance of surrender or during the act of surrender, in other words, "summary execution". As a result of this policy, over 300 individuals, more than half civilians unassociated with the IRA or the broader republican movement, have been killed by British crown forces in the North since 1969. The failure to prosecute soldiers for the slaughter of 14 unarmed, innocent civil rights marchers in Derry on Bloody Sunday in 1972 set the stage for future murders of civilians by British military and marked a watershed in the Nationalist community's attitude to the assorted military forces of the British crown. The "shoot-to-kill" policy is the result of this indulgent attitude of the courts toward the murder of Irish nationalists or republicans. Of all these cases of 'suspicious' killings by British soldiers or RUC, few have gotten to the courts. From 1972 to 1987, only 17 trials against British military personnel took place for the murder of Irish people. Only two were found guilty. One was sentenced to 12 months detention in a Young Offenders Centre, suspended for 2 years. The other, Pvt. Ian Thain, was sentenced to life imprisonment but was released after little more than 2 years and immediately reinstated to his former regiment! In 1994, another British army private, Lee Clegg, was convicted of the murder of a teenage, Catholic girl in West Belfast [see the Case of Pvt. Lee Clegg in the Prisoners section on the Main Directory]. He was sentenced to life imprisonment, after an army cover-up failed to obscure the truth of the "shoot-to-kill" nature of the killing. Like Pvt. Thain before him, Pvt. Clegg was released from prison after serving only two years of his life sentence, returned to the British army, and given a promotion to boot. Between late 1977 and late 1978, the number of selective assassination increased dramatically as 10 people were murdered by crown forces in covert operation. It was, however, the success of Provisional Sinn Fein in the October 1982 assembly elections that led to the full unleashing of shoot-to-kill operations against the nationalist community. Between 1982 and 1985, 35 people were killed by crown forces, 23 of them in covert operations. Only one of those 23 was not a known or suspected Republican activist. The lack of accountability for these killings shows that British military forces in Ireland have, to a large degree, been granted the power to decide the guilt or innocence of suspected Republican activists without recourse to the courts. On November 11, 1982, Gervais McKerr, Eugene Toman, Sean Burns were driving in Lurgan when an RUC patrol opened fire, killing all three. All were unarmed. It was claimed that the men had driven through a police roadblock and refused to stop. The RUC opened fire on the car and claimed that fire was returned. The car then came to a halt. The RUC officers said they heard the sound of a gun being cocked and they opened fire again. Toman was found lying out of the car with bullet wounds in his back. The officers had fired 109 bullets into the car. They were not just RUC men, but members of a British army trained Special Support Unit. These officers originally claimed to be part of an ordinary RUC patrol and did not disclose that three dead men were under surveillance and stalked for some time. They changed their story when they were re-interviewed and the restrictions of the Official Secrets Act waived. Justice Gibson held that this RUC special unit acted in "self-defense" and had used reasonable force in attempting to effect an arrest -- 109 rounds fired into unarmed men! He stated that the prosecution never had "the slightest chance of sustaining a conviction" and then commended the RUC men for their "courage and determination in bringing the three deceased men to justice; in this case, to the final court of justice." On August 22, 1984, Armagh coroner Gerry Curran resigned due to "grave irregularities" in police files. Just the following week , the acting corner, James Rodgers said he would be unable to take over the inquest due to "professional commitments" and he too pointed to a number of differences between the RUC account as contained in files versus the account given in court. The inquest was adjourned pending an inquiry by John Stalker and members of the Manchester Police from England. The inquest into the deaths of McKerr, Toman and Burns was transferred to the Belfast coroner, James Elliot. John Stalker, Deputy Chief Constable of Greater Manchester, conducted an inquiry into a number of 'suspicious killings' by the RUC. Mr. Stalker concluded that there were grounds for charging a number of police officers, including senior RUC men, with a range of serious offenses. During his investigations he carried out forensic tests, the results of which contradicted evidence presented in court. In the case of the RUC killing of Michael Tighe, it was apparent that an ambush led directly to the "cold blooded murder" of the wrong man. Then came the cover-up. Stalker wished to interview Chief Constable Herman and one of his deputies "under caution." The tapes in the Tighe case had been mysteriously wiped clean! He also discovered that an informant was paid £2,000 after the execution of McKerr, Toman and Burns and was also involved in the Tighe killing. The RUC prevented Stalker from interviewing the informant. In January 1988, eight RUC officers were accused of "conspiracy to pervert the course of justice" and responsible for obstructing the Stalker inquiry. The Director of Public Prosecutions for N. Ireland declared that there would be no prosecutions. Because of "National Security!" It is difficult to see what "National Security" interests outweigh the public interest of bringing prosecutions against those in positions of trust and power who have committed serious crimes. This, and the many decisions like it, undoubtedly represents a potent reason for the Nationalist community to view the RUC as operating beyond the reaches of the law. Stalker's Findings: Sanctioned, "Deliberate Assassination"
Stalker said "the killings had a common feature: each left a strong suspicion that a type of preplanned police ambush had occurred, and that someone had led these men to their deaths." "The circumstances of those shootings pointed to a police inclination, if not a policy, to shoot suspects dead without warning rather than to arrest them. Coming as these incidents did, so close together, the suspicion of deliberate assassination was not unreasonable... There was no written instruction, nothing pinned upon a notice board. But there was a clear understanding on the part of the men whose job it was to pull the trigger that was what was expected of them." The fact that a large number of these incidents involved specialist units excludes the explanation of occasional aberrations by members of the crown forces operating in situations of stress. The remarks of the trial judges provide further official endorsement of such a policy. The Result: The Stalker Inquiry was suppressed. Stalker was rewarded for his efforts by being pulled off the inquiry befpre its conclusion, not before being publicly smeared in a concocted media campaign that destroyed his career. Amnesty International Critical of "the secrecy shrouding police/military investigations"
In 1991, Amnesty International published a highly critical report which blamed the British government for not properly investigating serious allegations of unarmed civilians unlawfully killed and positing that "the government has failed to set up independent inquiries to openly scrutinize overall patterns of police and army malpractice." "The secrecy shrouding police and military investigations has led many victims and their relatives to allege that authorities have actually suppressed important information and deliberately concealed unlawful actions," the report said. Amnesty said that even though more than 300 people have died in disputed killings by "security forces in N. Ireland" there has still been no wide-ranging investigation into this pattern of killings. The report concluded with a criticism of the coroner's inquest system that follow such killings but "by law cannot compel members of the security forces to testify at the inquest." After the Stalker fiasco, new disclosures came to light in 1989 of concrete and damning evidence linking the RUC with the widespread proliferation of secret British/RUC intelligence documents on nationalists and alleged "IRA suspects" directly to Loyalist Murder Squads, whose primary function is sectarian and political assassination. The RUC covertly or otherwise provided classified information, not on scores or hundreds, but on thousands of potential nationalist targets to the murder gangs. Considering the fact that many members of the sectarian RUC and the sectarian Ulster Defense Regiment [now the sectarian Royal Irish Regiment] are also deeply involved Loyalist paramilitary organizations, and the British army and intelligence agents focus almost exclusively against the nationalist community, the flow of crown force intelligence to Loyalist murder gangs must be seen as inevitable. John Stevens, Deputy Chief Constable from Cambridgeshire, England, headed a team of 20 British police under the authority of RUC Chief Constable Hugh Annesley. The controversy began in August when members of the Ulster Freedom Fighters murder gang exhibited copies of Crown forces secret intelligence documents to a BBC reporter to justify their recent assassination of a nationalist man, Loughlin Maginn of Rathfriland. How did they get these files? Maginn was named in the documents as an "IRA suspect" and it was his death warrant. Both the IRA and his family denied that he had any connection with the IRA, which always acknowledges their fallen volunteers. A week later, the UDR admitted that security documents were missing from Ballykinlar UDR base. The RUC, which promised "a thorough investigation into the mater," was forced to admit within days that large numbers of its own files were also "missing." To complicate the issue further, large numbers of these documents, which consist largely of photographs and personal information and addresses, began to irresponsibly appear in various British newspapers such as the Sun and the Scottish Daily Record, which published files on over 50 alleged "IRA suspects" after they arrived in anonymous letters. Collusion with Loyalist Extremists "has always existed... I can prove this absolutely." In September of 1989 the Stevens Inquiry team questioned a Loyalist UDA murder squad member, Albert Baker, serving a life sentence in England for a series of sectarian murders. In a letter to the Irish News, Baker stated candidly that "Collusion between security forces and loyalist extremists in N. Ireland has always existed. I can prove this absolutely. However, the terrible truth which I can reveal may result in another cover-up." When an Irish News reporter asked an Inquiry spokesperson about Bakers allegations, he stated that, "I can confirm that he has been in touch with us and what he has told us is being considered by senior officers." Baker subsequently stated that the second in command of his UDA murder squad was an RUC officer! In early October, further alarming facts came to light . A secret organization, comprised of currently serving and former RUC officers calling itself "The Inner Circle" sent the deputy editor of the Irish News a folio of sensitive and highly detailed documents containing the names and personal information on 233 nationalists, including 64 residents of the 26 Counties. The accompanying statement claimed that the group was pledged to eradicate Republican terrorism and the battle for the survival of Ulster." They went on to outline how the "Inner Circle" murder squad of police officers would use high-level information to "remove suspected terrorists" through their "close links" with the loyalist paramilitary Ulster Resistance, three of whose members are in prison in France for attempting to sell parts stolen for Shorts Bros., a Belfast military and aeronautics firm, missiles to South African agents for arms for use in Ireland. They went on to claim they were "pledged to do all in their power to bring down the Anglo-Irish Agreement" which they claim was the catalyst for their formation four years ago. According to the information passed on to the Irish News, the Inner Circe had operatives in every RUC division and sub-division, with only one exception, including the RUC headquarters. This statement, plus the impressive display of "secret intelligence" documents in their possession, was the largest single leak to date. Yet the Inner Circle stated that "the Stevens Inquiry will not have any impact on our group's objectives or methods. The stockpile of material which we have been able to build up during the past two years is detailed, highly accurate, and is being constantly maintained at full operational level. There is no way that the Stevens Inquiry will stop the information which we have access to." The Stevens people reacted by sending men to interview the Irish News editor who was first contacted by the Inner Circle, Terry McLaughlin! They neither confirmed or denied the existence of the RUC Inner Circle murder gang. Political figures on both side of the border reacted strongly with calls for real investigations coming from Sinn Fein, the SDLP, Alliance parties and others. All of the parties in the 26 Counties responded, even the conservative Fine Gael expressed they were "deeply disturbed." Following this development, a further 156 official files on "IRA suspects" were mailed by an ex-British soldier to the Northern Echo, which dangerously printed 15 of them. The soldier stated he wished to expose "the shambles of security in Northern Ireland." The same day, 49 more files were mailed to the Sinn Fein offices in County Monaghan, in the 26 counties. It seemed that Loyalist murder gangs had as much detailed information on nationalist as had the so called "police force". But this is not a new development in colonial Ireland. In 1986, the Sunday World reported that a secret group of RUC officers call themselves "The Inner Force" had vowed to assassinate the Chief Constable, Sir John Hermon, if "he stood in their way." Apparently, he did not. On October 8, 1989, the RUC, under direct orders from the Steven Inquiry, arrested 25 members of the British army's Ulster Defense Regiment in connection with missing intelligence documents on nationalists. By December, twenty three people were charged either of mishandling or misappropriating secret files. Eight members of the UDR were incidentally charged with possession of illegal weapons. No RUC were charged. Early Won Monday, January 8, 1990, the RUC arrested a number of loyalist suspects in connection with the "leaks". The London Independent reported the following day that information about the intended arrest was also "leaked" prior to an ineffective dragnet with the result that many of the suspects the Stevens wanted arrested disappeared. Even more incredible--the London Independent said it was also informed by RUC insiders of the impending arrests the day before they occurred. Apparently, Stevens, his team and everyone else was facing an RUC that wanted to publicly demonstrate it was a law unto itself. But there is more. On January 11, the Belfast Telegraph reported a "Mystery fire" at the Stevens Inquiry offices. Numerous documents and computer discs were destroyed. Stevens said that backup documents were in place for all of the material lost in the mysterious fire. The IRSP condemn without reservation the totally unwarranted searches of Teach na Failte and Republican Socialist offices and homes of our workers in Belfast and Strabane. These searches are little more than a politically motivated fishing exercise and an attempt by the PSNI/RUC to blacken the good name of Teach na Failte, a well respected former prisoners association whose work is mostly welfare based plus a conflict transformation and resolution project for ex-prisoners and their families. IRSP spokesperson Paul Little said: "The nature of these searches by the PSNI was aggressive, with doors being smashed down and disabled TnF project officer Eddie McGarrigle from Strabane, who is confined to a wheelchair, was thrown out of it by the PSNI and left lying on the floor. "There is absolutely no justification for these raids or their violent nature. The PSNI have demonstrated once again that they are not a new beginning to policing but rather a new politically motivated paramilitarist force that excels in all the bad traits of the RUC. "New uniform, same old story." General John de Chastelain has met senior members of the UDA in Belfast. The head of the Independent Commission on Decommissioning was accompanied by his two fellow commissioners, Andrew Sens and Tauno Nieminen, for the meeting at an undisclosed location in the city. A spokesman for General de Chastelain said there is an ongoing engagement with the loyalist group. Loyalist sources described the meeting as significant but said more work was needed before anything would be seen. It was the first meeting of the UDA and Commission since the IRA completed its decommissioning process. The role of Special Branch came under scrutiny again last week, with further media revelations concerning a secret internal report into the investigation of the killing of a Catholic pensioner in 1994. Questions about the role of Special Branch arising out of the report bear remarkable similarity to those recently exposed by the Police Ombudsman's inquiry into the Omagh investigation, which precipitated an unprecedented public display of outrage by the then Chief Constable Ronnie Flanagan. In both incidents Special Branch, far from acting as facilitators to the murder investigation, deliberately withheld information and in doing so possibly suppressed vital video evidence. 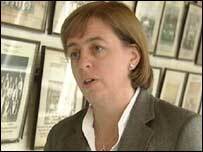 In the recent Ombudsman's report, Nuala O'Loan concluded that the investigation into the Omagh bombing had been 'hampered' because Special Branch and the British Army refused to release video evidence. According to the secret files relating to the killing of Roseanne Mallon, investigating officers were not told about covert British soldiers who were at the scene before, after and during the shooting. Material recorded at the scene by a hidden camera was initially kept secret. Tapes subsequently went 'missing' and British military logbooks were 'unavailable'. It has been suggested that in the case of Omagh, Special Branch reticence stemmed from a wish to keep their agents in place. In the Mallon case, the main beneficiary appears to have been the chief loyalist suspect and known mass sectarian murderer, Billy Wright. As an elderly spinster, Roseanne Mallon often stayed at the remote Killymoyle home of her sister-in-law Bridie. On the night of Sunday 8 May 1994, the 76-year-old was watching television alone when loyalist gunmen opened fire through the front window. A moment earlier, Bridie Mallon had left the room to answer a telephone call. Paula Mallon lived across the road and while speaking on the telephone she saw a car draw up and two men running up the driveway towards her mother's Cullenrammer Road home. She then heard the rattle of gunfire. As Roseanne Mallon struggled to her feet, she was hit several times and died a short time after the firing stopped. As the window blinds snapped up, giving a clear view of their victim, the killers continued firing. "They knew they were shooting an old woman," said Bridie. A short time after the incident, elaborate British Army spying equipment was discovered close to the house. Subsequently, the British authorities admitted that at the time of the killing the area was not only subject to a secret surveillance operation but was also being staked out by a covert unit of six British soldiers. Almost eight years after the brutal events of that night, the inquest into the killing has yet to be held. A number of loyalists were questioned shortly after the killing but without substantial evidence they were quickly released. To date, no one has been convicted in relation to the killing. The apparent disinterest with which the state has pursued the killers of Roseanne Mallon is far from unique. But the unexpected discovery of British surveillance equipment at the scene has marked out the case as unusual. Unusual, not because the murder scene was under surveillance at the time of the killing but, in the exposure of that fact. Just over two months after Roseanne Mallon's death, 9 July, a farmer working in a field close to the Mallon home removed what appeared to be a log stuck in a hedge and discovered a cable and transmitting equipment was attached. According to an internal RUC report, the surveillance equipment had been running at least 13 days prior to the killing and continued until it was uncovered in July. Film footage of two cameras, also discovered at the scene, was subsequently broadcast by UTV. The televised equipment was referred to as one small camera with a wide angled lens and another camera with a powerful telephoto lens. Television commentator Ivan Lyttle said the spy equipment included a modulator and a facility to transmit the picture. Curiously, despite UTV's unquestionable expertise in relation to camera and transmission equipment, the RUC and British Army vigorously denied that either camera had a zoom or night vision capability. Despite the fact that tapes were wiped and records doctored, a number of admissions still point to the contrary. One British soldier, described only as Soldier BB, was monitoring transmissions from the Cullenrammer Road operation at Killymeal Barracks in Dungannon on the night of the killing and the following day. Solider BB was present in the operations room when soldiers in the dugout reported hearing a burst of machine gun fire. According to documentation relating to the case, the operations room log, serial number 557 and dated 9 May 1994 at 1121 hours, carries the entry "still recording". This entry directly contradicts written statements by British soldiers involved in the covert operation who claim recording of the scene stopped shortly before the killing "due to poor light" and did not recommence until shortly after 4.30pm on the following day. Soldier BB attempts to explain the anomaly. According to his statement, "although the entry stated, "Still recording", I can say from viewing the log and from memory that tape recordings were not made between 2128 hours on 8 May 1994 to 1631 hours on 9.5.94." The soldier continues: "The entry 'still recording' means that the OP were still monitoring the area, not that tape recordings were being made." It's a clumsy attempt at a cover up. First, throughout all other documentation, "recording" is used in a very precise manner and is never substituted to mean "monitoring". Are we really expected to believe that the substitution of the word 'recording' for 'monitoring' appears only during this most crucial entry? Second, Solider BB claims that the covert unit were not 'still recording' on the grounds that they were 'still monitoring'; this suggests that even when members of the unit were not tape recording events, they were still able to view the scene. Otherwise, what would be the point of 'monitoring'? Third, as the RUC's own records show, the cameras enabled the covert team to identify vehicles, including reading their registration numbers from a considerable distance - an inconceivable task without the aid of zoom focusing. We know the soldiers in the stakeout heard the gunfire that resulted in the death of Roseanne Mallon; whether 'recording' or 'monitoring', the big question remains what and who did they see? According to documents relating to the case, the covert surveillance operation, which involved the deployment of covert British soldiers, was instigated and sanctioned by Special Branch. Two days after the killing of Roseanne Mallon a series of video tapes from the covert surveillance operation were given to a Special Branch officer known only as Constable A.
Constable A, who is believed to be have been a member of the Special Branch team who instigated the covert operation, is reported as having viewed over 28 hours of video footage before declaring there was nothing "to my knowledge which related to the murder of Roseanne Mallon". Constable A's evaluation was passed to the then head of Special Branch in the South region, Chief Superintendent Frank Murray. Murray informed the CID's Chief Superintendent, Maynard McBurney, about the camera but "nothing had been recorded", said Murray. No further action was taken. The in-house housekeeping had been done and dusted and it might have stayed that way. On 14 July, the RUC in Dungannon were informed by telephone by a local councillor that camera equipment had been uncovered close to the Mallon home. Deputy Sub Divisional Commander, Chief Inspector James Nixon, took the call. He denied all knowledge of the covert operation. On 19 July, Detective Chief Inspector Kenneth McFarland was informed of the surveillance find by the Mallon family's solicitor, Martin Donaghy. McFarland was 'unaware' of the covert operation. On 27 July, UTV broadcast film footage of the equipment and interviewed Christopher Mallon. On camera Mallon said he believed the covert British unit had recorded the murder of his aunt and demanded the tapes be produced. Two days later five videotapes and four logbooks were handed over to Chief Inspector Eric Anderson. Fourteen hours of tapes, from the day before the killing, were missing, as were some of the logbooks. Almost a year later in April 1995, Anderson submitted his report to RUC Headquarters. The cameras could not have worked in darkness, concluded Anderson, and therefore were of "no value to the murder inquiry." While the 'investigation' was going nowhere, the inquest into the killing was being delayed. Last week, despite having already suffered an eight-year delay, a preliminary inquest hearing immediately ran into difficulties after it became clear that the RUC/PSNI had 'failed' to provide statements from the six undercover soldiers at the scene during the killing. Curiously, despite the absence of the soldiers' statements, which the court was told could be irrelevant to the inquest, the British Ministry of Defence sent a lawyer to the Coroner's Court hearing. Someone, somewhere, it seems, is being remarkably vigilant in relation to information officially deemed of no value. At the heart of this story is one sinister word and that word is 'collusion' and at the core there are two names, the Special Branch and loyalist killer Billy Wright. An hour after the killing, Billy Wright and two others were arrested at a checkpoint. The three loyalists were driving away from the area and, they claimed, towards their homes in Portadown. At the time, Wright had told one of the arresting officers that if any firearms residue was found on his clothing he would claim that an RUC weapon had contaminated him. In the event, the forensic evidence to link Wright with the shooting was inconclusive and the three man were released without charge. The detectives investigating the killing had detailed information on Wright's contacts just prior to the shooting and details of the vehicles they were driving. But were any of these cars, or the getaway car, on the Cullenrammer Road before the shooting? Ignorant of the covert surveillance operation underway prior, during and after the killing, the detectives were unable to check details of the gang's vehicles and witness statements describing a suspicious green hatchback car against the covert surveillance unit's detailed log of traffic close to the Mallon house. In the wake of the killing, a member of the Special Branch team who instigated the covert operation, Constable A, was tasked with viewing the secret video footage and logbooks. To Constable A's 'knowledge', there was 'nothing' which related to the Roseanne Mallon murder. Meanwhile the detectives with specific knowledge of the chief suspect's contacts and their vehicles were being kept ignorant, not only of information captured on video but also the very existence of the video footage, logbooks and covert unit at the scene during the killing. But there is an even more sinister twist in the tale. Evidence suggests that Special Branch collusion went much further than protecting a loyalist killer after the event. Amongst documents relating to the killing are two statements by one named individual. Although named, unlike many of the other statements, the witness is not specifically identified as a member of the Crown forces. Yet in his statement, the witness describes himself as being 'on duty' and talks of completing a CI1 sheet. Both statements refer to events on 4 May 1994, four days prior to the killing. The first statement refers of an incident at 10.45am, when the witness reports seeing Billy Wright as a passenger in a car amongst traffic on the Dungannon side of Moira. The second statement refers to an incident at 8pm on the same day. The witness reports seeing one of Roseanne Mallon's nephews driving out of Portadown and towards Dungannon. The witness links these two separate incidents, on the grounds that the second vehicle was driving along a road where the witness had previously observed Billy Wright. Following the second sighting, the witness reports returning to 'Dungannon' and completing a 'CI1 sheet'. In other words, four days before the killing, Special Branch link the Mallon family to the subsequent chief suspect, Billy Wright. It is widely accepted that Billy Wright was a Crown forces agent, most probably attached to Special Branch. The sighting of a member of the Mallon family driving along the same road over nine hours after Wright had been delayed in traffic, in the mind of the Crown forces witness, appeared to constitute a sufficient threat against their agent to warrant taking immediate action. It is inconceivable that four days later the killing of Roseanne Mallon, by a loyalist death squad most probably led by Billy Wright, was coincidental. Did Special Branch 'tip off' their agent and by suggesting an imagined threat, set up the Mallon family for loyalist attack? Wednesday night's re-screening of Insight (19 October) by UTV on the RUC handling of the abduction and murder of Arlene Arkinson once again brings into sharp focus major investigative failings by the authorities in the North. Crucially Insight also highlighted the failing of the entire policing and criminal justice system including the role of the DPP. Both prevented evidence from coming to light and which permitted the perpetrator to continue to prey on victims here and in England. For many families across the country these failings are not new and they can empathise with the Arkinson family sharing both their experience and frustrations. Often these failings have been quite deliberate and to the advantage of the British state -- functioning in many controversial killings to shield their complicity as they waged their dirty war. Ironically, it was the DPP and the RUC who were heavily criticised in a landmark judgement by the European Court in May 2001 for major investigative failings. Indeed the unaccountable nature of the DPP, even beyond the remit of the Police Ombudsman, was singled out. At the centre of the investigation into Arlene Arkinson was one of the RUC's most senior members Chief Supt Eric Anderson. While viewers caught a glimpse of the real Eric Anderson, secretly filmed, scheming for money in return for an interview and access to crucial investigation documents he had stolen, and speaking disparagingly of the Arkinson family, my thoughts turned to the family of Tyrone pensioner Roseanne Mallon gunned down in her home by loyalists in May 1994. Shortly after the killing of Roseanne, neighbours of the Mallon's discovered wires and cameras secreted in hedgerows overlooking the Mallon home. On removing the cameras two helicopters arrived and camouflaged British soldiers emerged from two positions surrounding the property, boarded the helicopters and left. Eric Anderson was involved in the investigation into Roseanne's killing. His priority was to retrieve the cameras left behind. Anderson was consistently evasive as to how the British Army had failed to prevent the attack or apprehend the killers stating that it was a matter for others. It was established that the cameras transmitted footage to Mahon Barracks in Portadown where this was recorded. When the family asked for copies of the tape recordings Anderson stated that they did not exist. Three years later the Mallon family successfully sued the British Ministry of Defence for trespass and criminal damage. In the course of the legal action statements from the British soldiers present on the night of the killing were disclosed. All stated that they were ordered "not to intervene" as the attack took place. A statement for soldier 'A' based at Mahon Barracks said that he gave DC Supt Eric Anderson five tapes of the transmissions, four log-books and a blank log book. The family of Roseanne Mallon believes that vital evidence exists on these tapes that identify the killers. They want to know why the British soldiers were ordered not to intervene. They want to know what Eric Anderson did with the tapes, and log-books, and why Anderson needed a blank log-book. An inquest into the killing of Roseanne Mallon has been consistently delayed. Speaking to UTV Live on Friday 14 October, after the initial Insight screening, a nephew of Roseanne, Martin Mallon, told viewers that he believed Eric Anderson had the tapes and that he was shielding the killers. Motivated by greed and money it is now beyond question that Eric Anderson was corrupt and dishonest. The failure thus far of British Secretary of State Peter Hain to address the Eric Anderson issue stands in stark contrast to his denouncement of Fr Alex Reid in the House of Commons last week. The public need to hear from Peter Hain and Hugh Orde as to why Anderson has not been arrested for perverting the course of justice, and the stolen information retrieved. The Mallon family want Peter Hain to address the missing tapes and log-books. Anderson was involved in "investigating" scores of killings in which collusion was alleged, and huge questions remain as to why these killings remain unsolved. The key question is on how many other murders does Eric Anderson hold files and vital information? It is not acceptable for either Hugh Orde or Peter Hain to state that the Ombudsman will look into this — the remit of the Ombudsman is restricted and prevents it from taking action against any former serving officer or from examining the role of the DPP. Eric Anderson left the RUC citing his opposition to the Patten reforms. If anything the exposé by Insight hardens the case for an accountable and transparent policing and criminal justice system and for this to be devolved. The only logical step to be taken is an independent investigation into the activities of Eric Anderson — including a complete review of all the murder investigations he was involved in. • Relatives for Justice (RFJ) is a regional human rights NGO and support organisation for victims and survivors of the conflict. RFJ have worked closely with the Mallon family in their legal quest for truth and justice since the killing of Roseanne. The Government tonight ruled out a public inquiry into the alleged murder of a Belfast man by RUC police informers. Raymond McCord, 22, was beaten to death by a gang who later dumped his body in a quarry in north Belfast in November 1997. Mr McCord’s father, Raymond Snr, later alleged that RUC special branch officers blocked the police inquiry into the murder because it implicated two Ulster Volunteer Force (UVF) members who were both alleged police informers. Northern Ireland Police Ombudsman Nuala O’Loan is currently completing a two-year investigation into the allegations by Mr McCord Snr. Irish Labour Party leader Pat Rabbitte tonight claimed under parliamentary privilege in the Dáil parliament that two Special Branch informers Mark Haddock and John Bond were present when Mr McCord was murdered. Mr Rabbitte called for an international public inquiry into the affair as soon as the Ombudsman’s report is published. But Noel Treacy, Minister of State at the Department of Foreign Affairs, replied in the Dáil that the Government had complete confidence in the independence and competence of the Ombudsman’s office in carrying out a rigorous investigation. He added: “In the context of the sensitive stage that the investigation has reached, any comment on the possible establishment of an independent inquiry into this issue would be premature. The minister said the Ombudsman’s investigations were largely complete and that an interim report had been sent to the Public Prosecution Service in the North. A final report will be seen to the PPS shortly and the public report will be released following the PPS’s deliberations. Mr Rabbitte added under privilege: “Mr McCord has lost a 22-year-old son to a violent and ruthless organisation that seems to have operated with the surreptitious sanction of the police.